Chrysal Technosysts Ventures Pvt. Ltd. I had the opportunity to work at Crysal Technosysts Ventures Pvt. Ltd. which is a start-up set up in 2013. The company is from the ITeS sector and basically provides IT enabled HR solutions to industries. 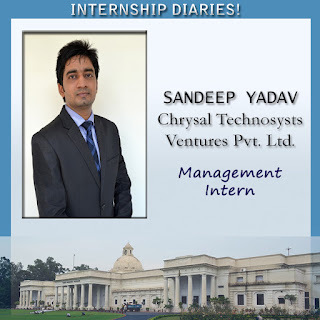 My role during the internship at Chrysal was of market research and lead generation in the Delhi NCR region. Major work involved ‘generating leads’ for their flagship product Abscontrack and other products as well in the B2B segment through various mediums viz. telephone, meetings, social media etc. This being my first experience at sales, the job seemed a little challenging initially and took me a couple of weeks to adapt to but later with the support and guidance of my mentor and colleagues I started to enjoy it. We used various mediums for lead generation like cold calling, linked In contacts and also walk-ins in the hot summer days but at the end it was all worth it. I also got the opportunity to interact with a number of prospective clients and pitch to them the concept of the products offered by Chrysal. My work at Chrysal also included market Research where in I had to analyze the response and acceptance ratio of various industries towards the concept of Abscontrack. I really enjoyed my internship duration at Crysal Technosysts Ventures Pvt. Ltd. and feel that everyone should experience sales once in their marketing careers as it gives a platform to develop numerous skills enabling you to understand the customer sentiment.